Searching homes for sale in Manuel Antonio, Puntarenas, Costa Rica has never been more convenient. 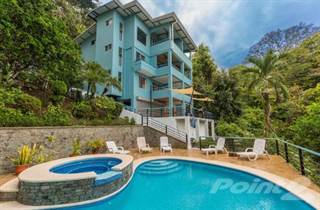 With Point2 Homes, you can easily browse through Manuel Antonio, Puntarenas, Costa Rica single family homes for sale, townhomes, condos and commercial properties, and quickly get a general perspective on the real estate market. Point2 Homes gives you far more than a simple list of houses for sale. Get instant access to loads of relevant information about Manuel Antonio, Puntarenas, Costa Rica real estate, including property descriptions, virtual tours, maps and photos. If you like a house for sale and you want to speak with a professional, simply contact the listing agent right from page of listing details. Or if you want to talk to an agent before anything else gets done, you can click the Tools tab and Find an Agent – you get a list of real estate agents in Manuel Antonio, Puntarenas, Costa Rica, all ready to give you top-notch professional advice on house prices and more detailed information about your target area. 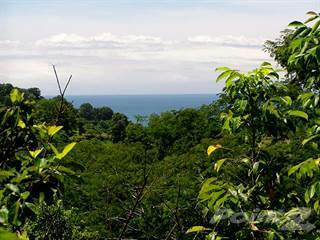 Use the map view to find homes and apartments for sale based on amenities and features in Manuel Antonio, Puntarenas, Costa Rica that you may want close by. You can select your preferred area or neighbourhood by using the radius or polygon tools in the map menu. 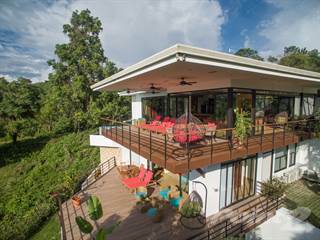 Filter among the 394 listings in Manuel Antonio, Puntarenas, Costa Rica, based on real estate price drops in the past six months, so you’ll never miss a bargain. Get new listings in your inbox, daily or every week, based on your preferences, by simply saving your searches. All it takes is two clicks. Manuel Antonio is often considered part of Quepos, a town of around 22,000 people located on the west coast of Costa Rica in the Puntarenas province. The Manuel Antonio community occupies a 7-kilometre stretch between Quepos and the Manuel Antonio National Park, which is situated along the coast of the Pacific Ocean. Communities located near Manuel Antonio include Naranjito, San Lorenzo, San Carlos, and Santa Maria. Manuel Antonio offers beautiful beach areas, as well as hills covered in rainforest, providing stunning views and plenty of wildlife. The community’s quiet location and natural beauty make it a desirable place for ex-pats and tourists. Spanish is the main language spoken here, but the influx of tourists and ex-pats have ensured that English is also an option. Manuel Antonio provides a mix of amenities in some areas and rugged, wild environments in others. The community is somewhat remote from very large cities and towns, which is a draw for people interested in less densely populated tourist areas. Highway 34 runs east of the community, connecting it to other communities along the coast. Many people traveling to the area fly into the Juan Santamaría International Airport in San Jose and arrange transportation to Manuel Antonio. Although Manuel Antonio National Park is one of the smallest parks in the country, it makes a powerful impact with sandy beaches, lush forests, sparkling blue water, exquisite coral reefs, and a wide variety of wildlife. There are approximately 109 species of animals and 184 species of birds in the park, examples of which include sloths, iguanas, squirrel monkeys, crabs, dolphins, whales, snakes, bats, toucans, woodpeckers, hawks, parakeets, turkey vultures, and tanagers. Visitors can take private tours of the park, or explore on their own. Because the park is such a popular destination, the number of people allowed in at any given time is limited to ensure an enjoyable experience and to lessen the impact on the natural environment. Besides hiking and taking tours, other activities in the park include surfing and snorkeling. Sport fishing in nearby Quepos is also a popular activity in the area, and the waters here are home to fish such as snapper, sailfish, dorado, yellow fin tuna, big eye tuna, marlin, roosterfish, amberjack, and wahoo. Several charter companies operate in the area, and those who enjoy angling can fish inshore or offshore, as well as do some fly-fishing. Guides are useful when looking for fish breeding hotspots in the area. The town of Quepos has a new marina called Marina Pez Vela, which has 200 wet slips that can accommodate boats up to 200 feet in length. The marina also has a dry rack that can accommodate boats up to 38 feet in length. Other activities enjoyed in and around Manuel Antonio include canopy tours, kayaking, boating, surfing, horseback riding, water rafting, scuba diving, swimming, going to festivals and events, visiting the farmers’ market in Quepos, shopping at local boutiques and gift shops, learning about the area’s history and culture on tours, and dining at restaurants that feature a variety of local and international fare. Much like other communities in the area, Manuel Antonio has a tourism-based economy, with accommodations, restaurants, tour outfitters, surfing schools, bars/lounges, and other service-based businesses operating here. Two national parks are located near Manuel Antonio, which also provide employment opportunities for locals and ex-pats. Many of the ex-pats who live here are retired, but some work locally, own local businesses, or work or run businesses remotely via phone and internet. Owning investment property in the area is common for ex-pats, who rent out homes and condos to tourists. The rise in Manuel Antonio’s popularity among tourists and ex-pats has led to increased development in the community, as well as just outside of it, providing construction and real estate companies with plenty of business. Two of the community’s oldest professions – agriculture and fishing – still operate here, though much of the agricultural areas are found outside of the community, and the fishing industry is largely becoming tourist-related. The unemployment rate in Manuel Antonio is around 7%, which is similar to the national rate. Manuel Antonio’s northern section includes residential areas, accommodations, restaurants, service providers, beach areas, bars/lounges, and churches. The central section of the community offers residential areas, restaurants, shops, pharmacies, churches, accommodations, service providers, parks, beach areas, spas, tour outfitters, and tourist attractions. In the southern section of Manuel Antonio, there are beach areas, a national park, accommodations, restaurants, shops, service providers, a nightclub, tour outfitters, tourist attractions, residential areas, hiking trails, and a nature reserve. Manuel Antonio has some of the most expensive real estate in the area, and available properties can be found throughout the community. Single-family homes are common here, and tend to start at around $200,000, with prices going up into the millions of dollars. Most homes are on treed lots, and those built on the hills surrounding the area provide fantastic views. Many homes are located in gated communities, providing additional security, and many include amenities such as private pools, gardens, large kitchens, and multiple bedrooms and bathrooms. The prices of condos in the community tend to start at around $200,000 and go up from there. These often include access to a shared pool, as well as private balconies. Views are also a bonus for condos located up in the hills. Vacant land can be expensive in the community, with prices starting at around $100,000. Commercial properties include residences that are rented out to tourists, with commercial buildings for businesses also sometimes available. Other than language schools, there are no schooling options in Manuel Antonio. Residents must look to nearby communities for schools such as Escuela Cristiana El Puente, Escuela Maria Luisa de Castro, Escuela El Cocal, Escuela La Inmaculada, and Escuela el Estadio. Language schools include Manuel Antonio Spanish School, Maximo Nivel, Os Costa Rica, and Cosi Costa Rica Spanish School. Residents also have to travel to other communities to access post-secondary options such as UNED Quepos, Quetzel Education Research Center, Universidad Panamericana Puriscal, San Isidro Labrador International University, UTC Sede Parrita, Universidad De Las Ciencias Y El Arte Sede Perez Zeledon, UMCA, Colegio Fernando Volio Jimenez, and Universidad Libre de Costa Rica.